Set on a spectacular headland, Sorrento features one of the most magnificent coastlines in Italy, with stunning views sweeping across the Bay of Naples. It is both an ideal base from which to explore the main sights of the Neapolitan region and an enchanting town in its own right. Sorrento is on the western coast of Italy, about halfway between Rome and the tip of Italy's 'boot'. Its elevated position offers panoramic views of rolling hills, rugged coastline, and crystal clear blue waters. The old town is full of charm with a wealth of bars, restaurants, boutiques, and ancient buildings. 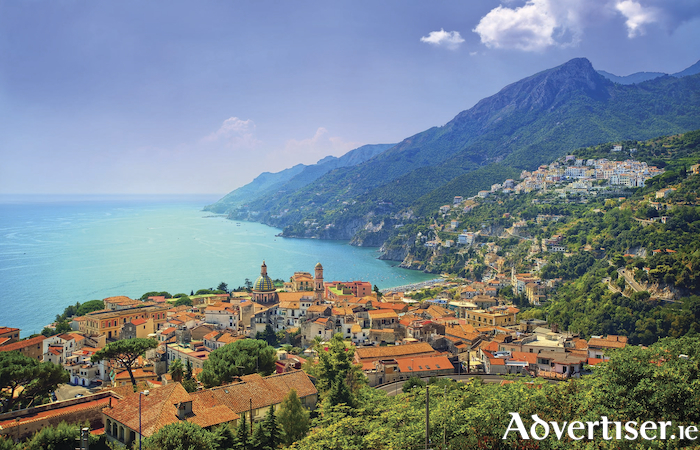 Prepare for a thrilling drive along one of the most jaw-droppingly spectacular coastal routes to the beautiful town of Amalfi 50km away, situated on the Sorrento Peninsula it lies in a deep ravine surrounded by dramatic cliffs and magnificent coastal scenery. Historic and stylish, this small ancient town is easily discovered on foot. It is the main town on the coast with many shops, restaurants, and cafes. It has a small pebbly beach. Visit the nearby towns of Minori and Maiori, which share the same charm and pretty beaches of their more famous neighbour. In between are the picture-postcard resorts of Positano, a picturesque vertical cliffside town where the roads are replaced by steep flights of steps leading to smart restaurants and chic colourful boutiques; and Ravello, a quiet little hilltop village where you can do a little shopping, enjoy a coffee, and most importantly, take in the spectacular views spread out below. Take a boat trip to the island of Capri, a magical place steeped in history and culture. Sample its chic lifestyle, gourmet cuisine, sophisticated shops, and soak up the Mediterranean sun on one of its pebbly coves. The beautiful Bay of Naples is dominated by two important landmarks, the archaeological site of Pompeii and Mount Vesuvius. If you would like to make sure you see the most important sights in Sorrento, call in to Corrib Travel, located at 2 Eyre Square, for expert advice, or phone 091 564713.